Uefa chief Michel Platini is appealing after Fifa banned him for 90 days while corruption claims are investigated. The 60-year-old Frenchman has been suspended along with Fifa president Sepp Blatter and secretary general Jerome Valcke. They deny wrongdoing. Platini, a Fifa vice-president, is the Football Association's preference to succeed Blatter at Fifa. The French FA wants the Court of Arbitration for Sport to intervene to ensure Platini can stand for election. Fifa's ethics committee began its investigation after the Swiss attorney general opened criminal proceedings against Blatter in September. He is accused of signing a contract "unfavourable" to Fifa and making a "disloyal payment" to Platini. The ethics committee also opened an inquiry into Platini over the 2m euros (£1.35m) payment, which was made nine years after the former France footballer carried out consultation work for Blatter. Fifa will hold an emergency meeting on 20 October in Zurich to discuss February's presidential election, at which a successor to Blatter will be chosen. Platini, Uefa's president since 2007, has been backed by South America's football confederation following his suspension. Conmebol said he should be regarded as innocent until proven guilty. The French Football Federation is expecting a decision from Fifa's appeal committee within eight days. 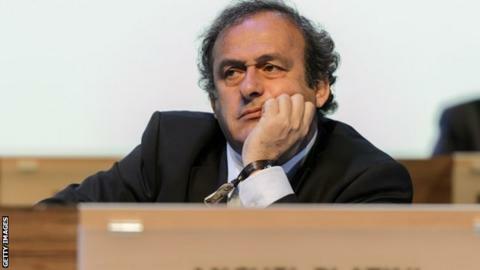 "The FFF has adopted the principle of an appeal if the decision of the Fifa appeal committee does not go Michel Platini's way," said a FFF spokesman. Blatter, 79, won a fifth consecutive presidential election in May but announced he would be stepping down just days later following the launch of two investigations into Fifa by United States and Swiss authorities. Platini is one of the favourites to replace him and still plans to stand. He has the full backing of Uefa, which is holding an emergency meeting next week.